Rodney Shepheard lived at Bourne House in Brimscombe in the 1940s. He was an engineer and every day he walked across Hack’s Bridge to work at Bullock and Parsons, the iron foundry on Brimscombe Basin. He was also a keen amateur photographer and a member of Stroud Camera Club. Over the next few years, as well as many holiday photographs and family portraits, he took photographs of the Thames and Severn Canal, the nearby hills and villages, the foundry, and at home. Early in 2016 Rodney’s son Peter, who now lives in St Andrews, was in Stroud for a music festival. He brought the cabinet with him in the hope of finding a new home for it in the town. 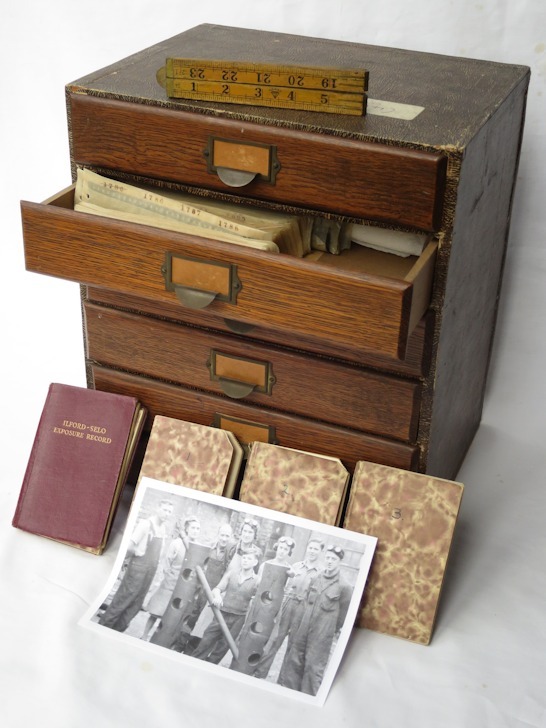 Over the course of one weekend, following a flurry of telephone conversations and visits, Peter offered to leave the cabinet with Stroud Local History Society so that any photographs that would be of interest to local societies could be identified, scanned and made available. There were about 4,000 negatives, two boxes of glass plates and a box of colour transparencies. Fortunately every negative was numbered and its details recorded in one of four small Exposure Record notebooks. The first job was to transcribe the notebooks to get a list of the photographs. Over the following year Marion Hearfield did this, then read through the descriptions to tick all those that sounded interesting to local historians and societies, resulting in about 250 negatives to be checked. Tony Macer then scanned every ticked negative to make a positive image and, at the March 2018 meeting of SLHS, 200 of the photographs were shown to members and visitors in a packed meeting. The cabinet of negatives is now in the care and custody of the present Stroud Camera Club. The SLHS Shepheard Photograph Collection of digitised images is offered freely, under a Creative Commons licence, for fair use by local societies in exhibitions, talks and displays under a few simple conditions: the photographs remain the copyright of Peter Shepheard, they cannot be sold or put in a book without Peter’s consent (or that of SLHS), and each use should be acknowledged as “©Peter Shepheard courtesy of Stroud Local History Society”. Here is a link to the online archive of photographs; we hope you will enjoy browsing through and find images of delight and usefulness. Double-click the link for an instant slide-show; single-click it to display its list of photographs that you then can view or download.